Greg with CEO Scott Drever of SilverCrest Mines at the Santa Elena project in Mexico. 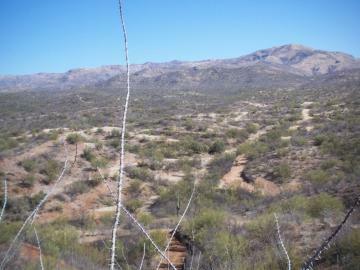 This is the picture of the Santa Elena project before it was built. This area is now a profitable economic open-pit mine producing silver and gold. Greg in the underground historic workings at the Santa Elena project. We were looking at the high grade vein that ran along the roof of this tunnel. Pretty scary ladder the modern team built to access the historic underground workings. Those miners must have been some incredible people to build this underground mine without modern equipment. I was absolutely amazed at how much work this represented. Greg looking at the map of all the underground workings and being shown a high grade vein in the wall. This area holds additional mineraliztion near the Santa Elena mine that was being drilled while I was on the site visit. This area today is now part of the mine. Greg holding a very nice looking piece of drill core pointing to the mineralized section within the quartz host rock. Greg with the team at the Santa Elena near dusk.